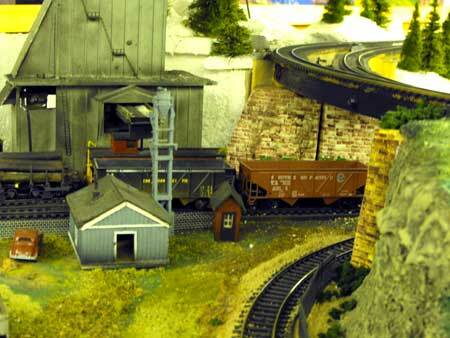 These model train pictures were taken at Gord Baverstock's layout in Owen Sound, Ontario. 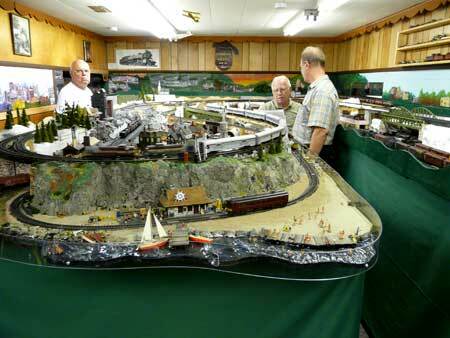 I first met Gord a few years when he was the auctioneer at our Nottawasaga Model Railroad Club's annual auction. 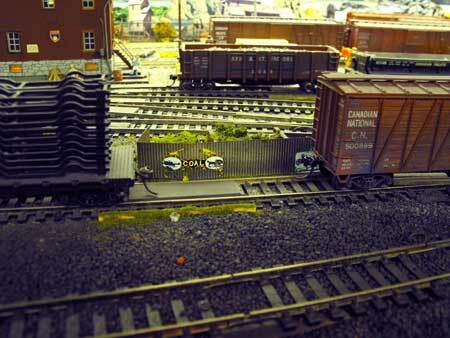 It was only recently that I had the opportunity to take some model train pictures of his HO scale, DC-controlled layout. 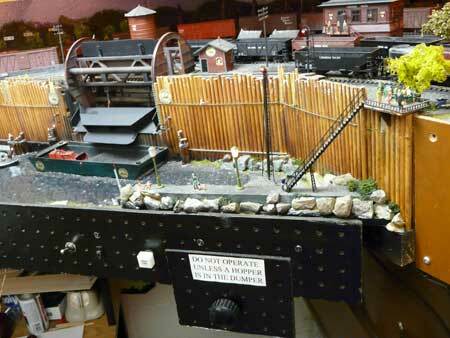 Gord is a long-time model railroader well known in this part of Canada. 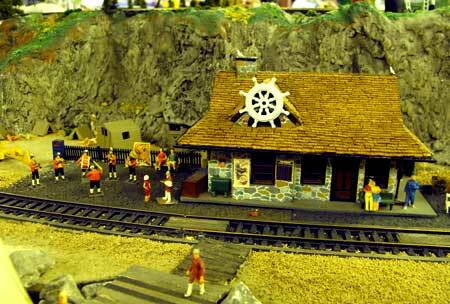 He is also one of those modelers who can figure out how to make things do what he wants them to do. 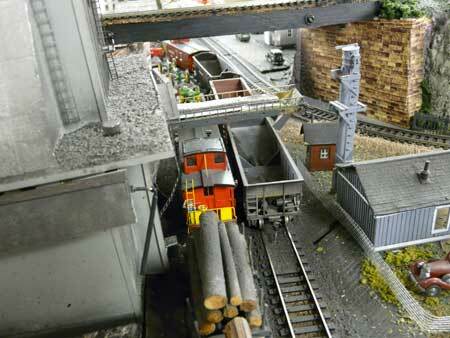 You'll find model train pictures here of an operating Walthers rotary dumper. This was designed as a static model. Gord decided it had to work. 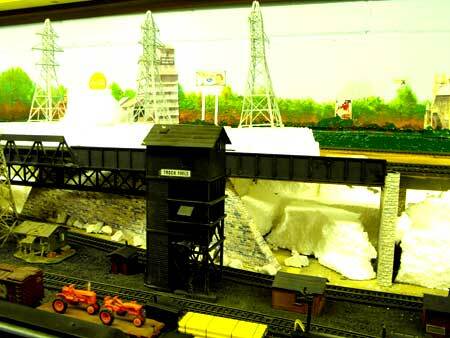 He built a companion coal mine that fills hoppers with real coal (actually N scale cinder ballast). The belt was sewn by his wife, Donna, from a pillow case and it runs across a couple of sewing bobbins. 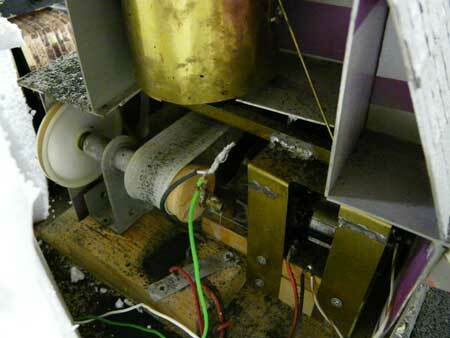 Gord made a bin of brass and hooked up a motor to power it through some old gears he had lying around. 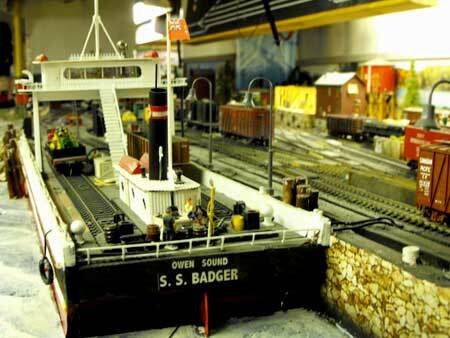 There's are some model train pictures of it below.Now you can fill up some hoppers cars and pull them across the layout to another room where they are then emptied into a waiting barge. A true "empties to loads" and back to empties conversion. Gord also figured out how to operate some signal lights using a bridge rectifier and 1-volt micro bulbs, a circuit that only costs pennies to make. I never saw the old layout in the same room that was run from an inside pit reached by duckunders. 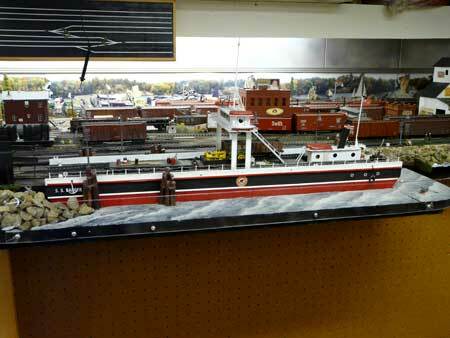 Gord decided to rebuild the layout as a walk-in with a center peninsula. 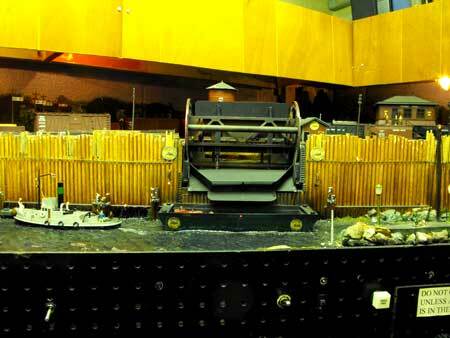 The model train pictures here are a work-in-progress because a lot of the scenery has not been redone yet. Gord left the backdrops he had previously painted on the cement walls. Instead of the denser blue or pink insulation foam board, he uses the white foam that you often find in packing crates as a scenery base because he says it's easy to break and shape with your hands although it creates a bit of a mess. He also built the subroadbed by the spline method, but instead of gluing the seven splines he bolted them together. There are pictures here if you're interested. I had used the older method of gluing and clamping them. His method avoids all the glue drips. Gord looks for inexpensive solutions. You'll see photos here of his control panels where he uses test lead probes to activate switch machines by touching the head of a brass screw to complete the electrical circuit. Kadee used to sell probes and brads for this. I still have a few in my catch-all electronics drawer. 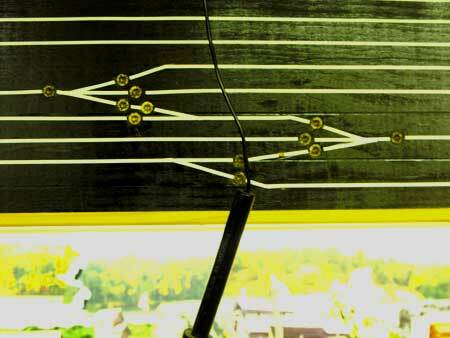 There's a picture here of a hanging control panel with the track diagram on it. The panel isn't lettered yet because the diagram is self-explanatory. Gord's manual switch machines use a simple slide switch. When top-mounted he disguises his switch machines behind fences and inside buildings. Another trick is his method of posting signs at block termination points with the numbers of the corresponding blocks. 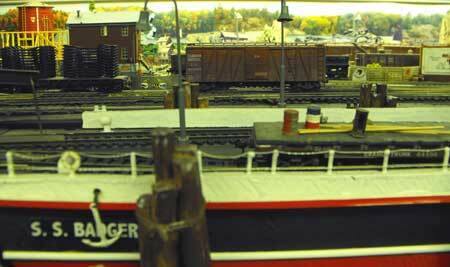 I hope you enjoy these model train pictures and find some useful tips and techniques here when you study the photographs that Nottawasaga club member, Bill Payne, and I took. Click on the thumbnails for a larger view. 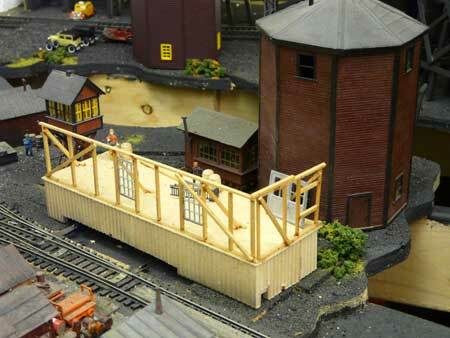 (left to right) Dave Falconbridge, Gord Baverstock and Chris Kapteyn around the new walk-in peninsula on Gord's layout. An overview of the layout showing the spline subroadbed construction with bolts instead of glue. 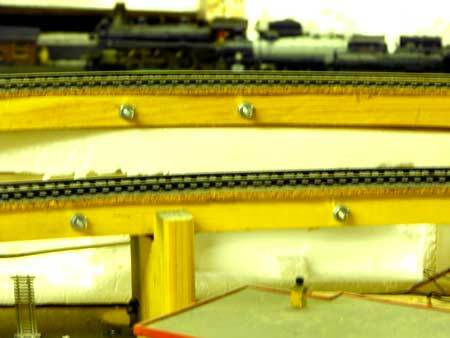 The spline roadbed is 7 layers thick to slightly larger than 2" width and is bolted together instead of being glued. Here is a closeup of the operating rotary dumper. 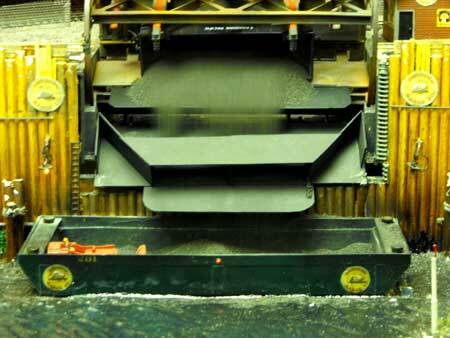 A hopper has just been pushed into position and has been rotated to dump its load of coal. It's takes good reflexes and practice to load and unload the hoppers into the barge. The barge is then unloaded by hand back into the coal tipple's bin so the process can start again. No room for a roundhouse? How about building a false front as Gord did here. 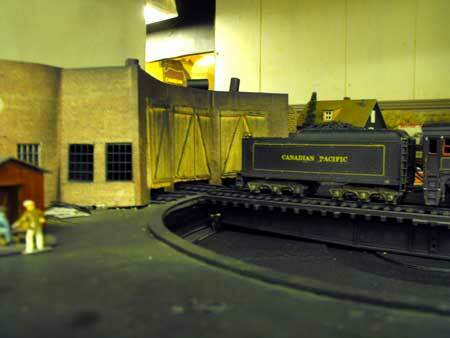 The layout's edge is behind the roundhouse doors and wall. Doug hides top-mounted switch machines inside buildings. This building is under construction. (Bill Payne photo) Another view of the building hiding the switch machines. Openings are left for the levers to slide in and out. When there is no room for a building Gord hides switch machines behind a fence. 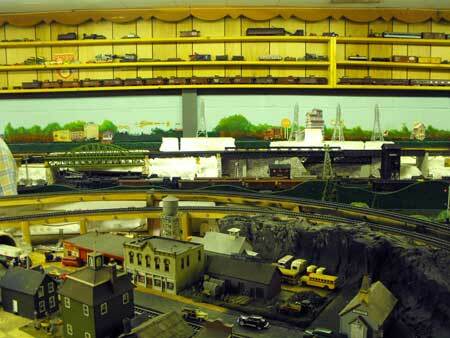 The layout here is always viewed from this side. 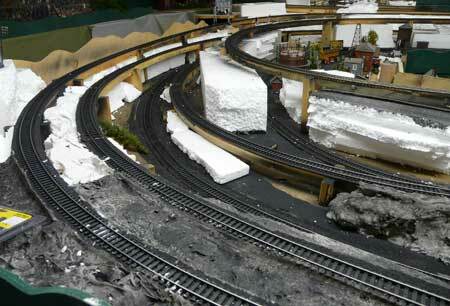 This shows another view of the white foam being used in chunks to build up the basic scenery shape. 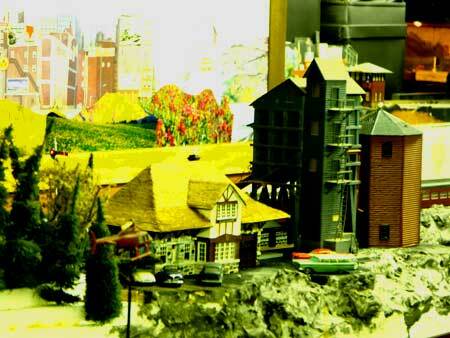 Here you see how Gord has blended a station scene into a city without using a lot of real estate. This is a lovely country station scene. There's a beach in front with lots of bathers and sun worshippers. 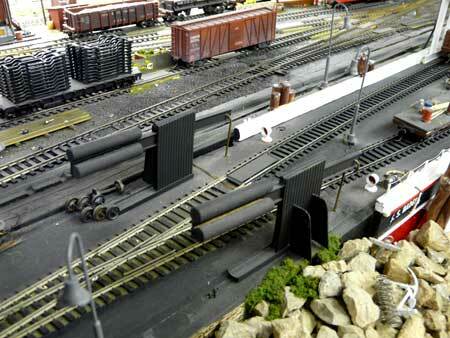 Return from "model-train-pictures" to the Train Photos overview. 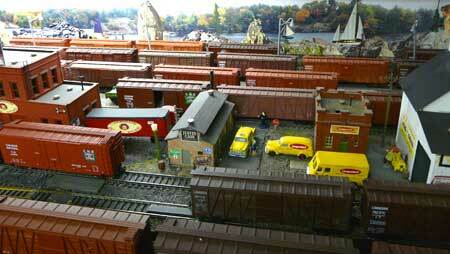 Return from "model-train-pictures" to my Home Page.